That’s rookie Trent Richardson debo’ing the hell outta some guy. Scary stuff. Welcome to the NFL, Brandon Weeden! He then proceeded to throw 4 picks. 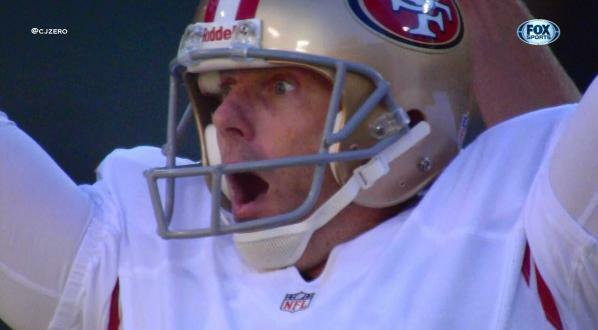 David Akers – who’s been in the league since the 1800’s, banked in a 63-yd FG. 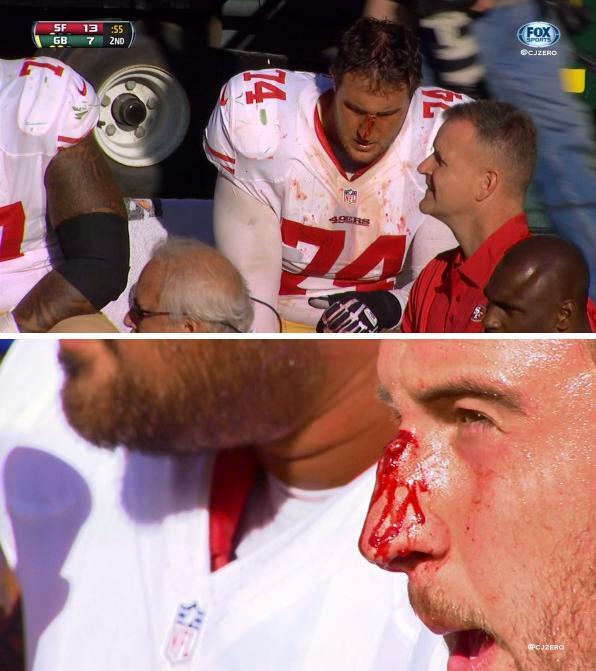 Joe Staley of the Niners may have been hit in the nose. Percy Harvin got goosed by the Jags. Not cool, man. 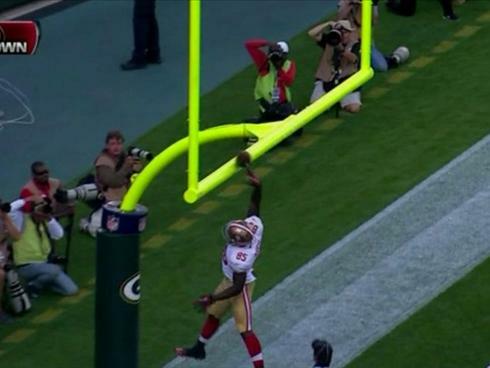 Vernon Davis went up for the goal post dunk post-TD… it did not go well. Some rookie named Mark Barron introduced himself to Steve Smith. 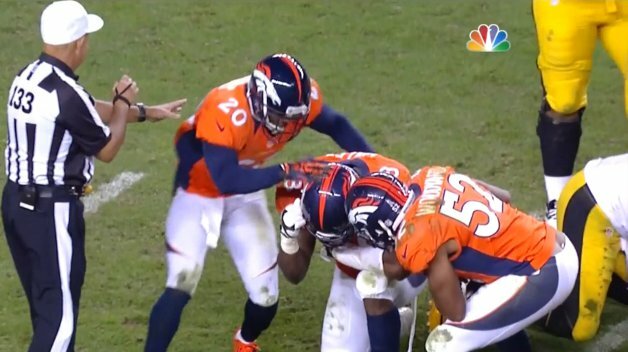 Von Miller, a beast, got 2 consecutive sacks. He Tebowed after the second one. Tebow who? 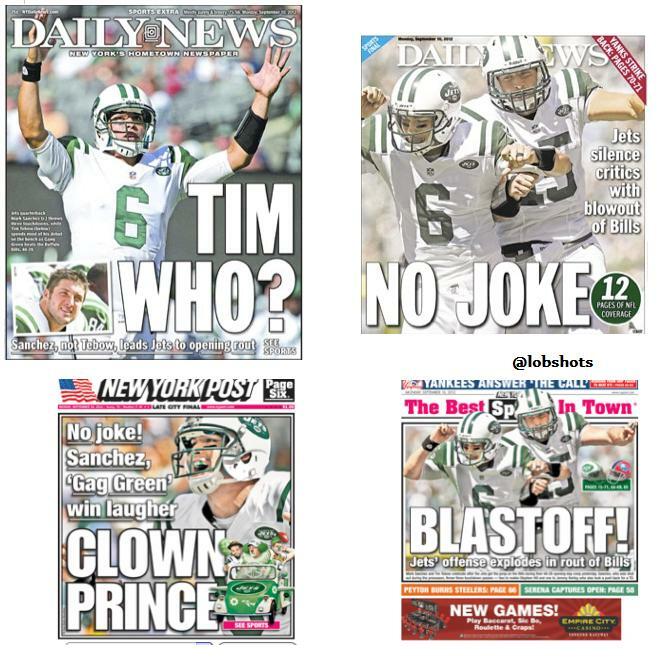 Proving once again, the pre-season doesn’t matter… Mark Sanchez went off. 3 TDs. Destroyed the Bills. Also, RGIII was amazing, and a newspaper still did this to him. Peyton Manning looked like the Manning of old. Very impressive. Bolts game tonight. Get fired up, lobsters. This entry was posted in Football, NFL and tagged bills, brandon weeden, brandon weeden flag, Browns, david akers, david akers 63 yard field goal face, gronk, gronk spike fail, gronk'd, Jets, joe staley, mark barron, mark barron hitting steve smith, NFL, nfl highlights, percy harvin, sanchez, tebow, tebowing, Trent Richardson, Trent Richardson bulldozer, vernon davis, vernon davis dunk fail, vernon davis td fail, von miller, von miller sack dance, von miller tebowing. Bookmark the permalink.